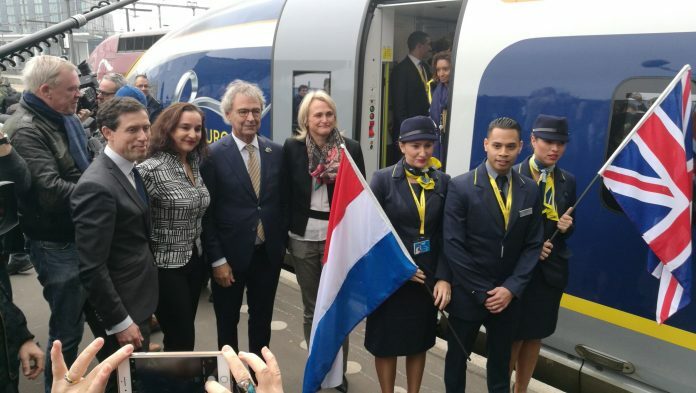 Yesterday marked an historic day for cross-border train travel as Eurostar launched its inaugural service from London to Amsterdam. 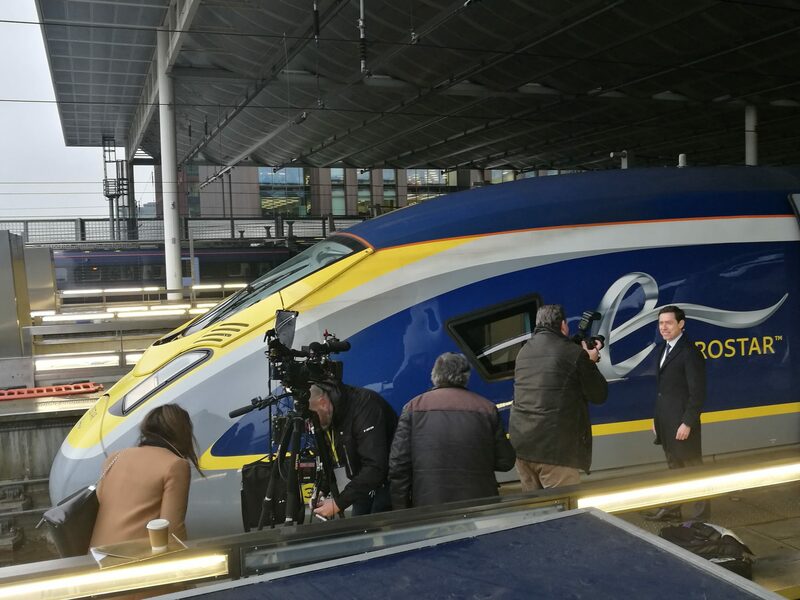 Staff, guests and industry press travelled on Eurostar train 9114, which left St Pancras International as scheduled at 08:31. By avoiding stops at Ebbsfleet, Ashford and Lille, the train achieved a record time of one hour and 46 minutes to Brussels Midi, and was later welcomed into Amsterdam Centraal station by hundreds of people – despite arriving there a couple of minutes late – after a short call at Rotterdam Centraal station. Roger van Boxtel, CEO of Dutch operator Nederlandse Spoorwegen (NS), was among the crowd. Greeting passengers, he said that while some seek to pull Europe apart, he – as well as the new service – wants to bring Europe closer together. NS is the licensed operator of Eurostar’s Amsterdam service on the section between Brussels and Amsterdam. 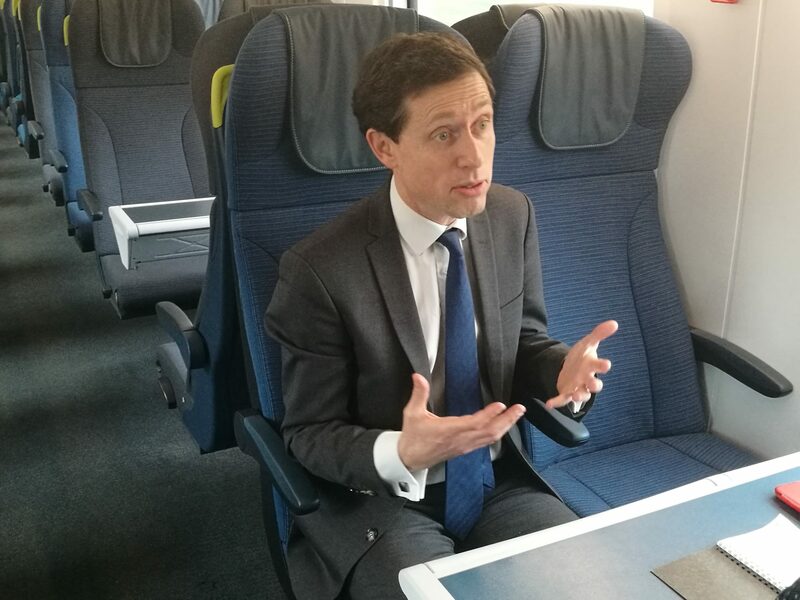 A group of 15 of its drivers has already been trained on Eurostar’s e320s in London through a mixture of theory, virtual reality and hands on experience aboard stationary trains. A further five NS drivers will complete their training before the passenger service launches. As is the temporary measure while the UK and The Netherlands governments’ complete an agreement to enable passport checks to be conducted on departure in The Netherlands, the return trip saw the party depart Amsterdam on a Thalys service to Brussels, and later board a Eurostar train. Eurostar expects this to be cleared up and direct services to operate from Amsterdam-London from the end of 2019. The eagerly anticipated service to Amsterdam has been penned for a number of years but outgoing Eurostar CEO Nicolas Petrovic said it has had to wait for arrangements to be in place on the Dutch side and for the Siemens e320 trains to be delivered and certified. “Everyone wanted it to happen, it’s just been a lot of work,” he said. Petrovic expects leisure to be the main motivation of the service’s passengers, particularly from countries such as Brazil, the US and China, as well as business. He added: “It is really going to change the shape of the business. The potential is very high because the traffic is already very strong. “We know there are even more people who could travel both ways because many people don’t travel short haul these days because they’re a bit anxious – a little bit worried – about flying. “It’s going to bring the two countries closer together. “In the context of Brexit it is a nice symbol that, yeah, there is Brexit but neighbours are still there and the exchanges will still be very strong between both sides of the channel. I think in the mid-term it will completely change the way people interact between the two countries, it will feel a lot closer. “[Brexit won’t] have an impact but there will be complications in the way Eurostar operates, the legal framework completely disappears but we will find solutions. Plans have already been mooted for an express service between the two capital cities and the potential for the service to further expand into other European cities. But those ambitions will be for incoming CEO Mike Cooper as Petrovic joins Siemens (France) as CEO on March 1. Ticket sales for the commercial London-Amsterdam services, which start on April 4, also began on February 20, but that launch didn’t go as smoothly as the inaugural service. Eurostar initially expected tickets to go on sale at 4pm but later released a statement saying it had been pushed back to Thursday 22 “whilst [it] irons out a few issues”.